Beyond everything else, I first want to express a great deal of happiness for posing me as one of the top Indian Young Scientific Contributors, in field of microbiology, in the magazine Micrographia Today (Link). Second, The past week I had the pleasure of interacting with Eric Lander, who visited the campus to interact with students. Also his later talk in TNQ series (Link) was fascinating. The lack of time had not allowed for a deep discussion, but his perspectives in thinking about problems in genetics led me to rethink certain aspects of microbiome. I have already talked about the microbiome in my previous posts (Link here and here). I need to digress a little bit here to see where the argument is heading. A lot of understanding in science is contextual basis and the difference between good and bad is often very blurred. For example, Obesity is one of the greatest challenge in current medicine. The situation is probably multi-factorial and genes have a lot of role to be played here. So would you designate the gene as bad. The tendency is to say so. The point is its not. There is nothing called bad and good genes. It depends on context. I have got into lot of arguments on this point earlier. Since Eric affirmed in this case my thinking is right, I will go ahead with argument. In a time when humans where evolving, food was scarce having a gene that makes you obese was actually a bonus. The situation has changed only in past 200-400 years, a time too small to evolve out of it. 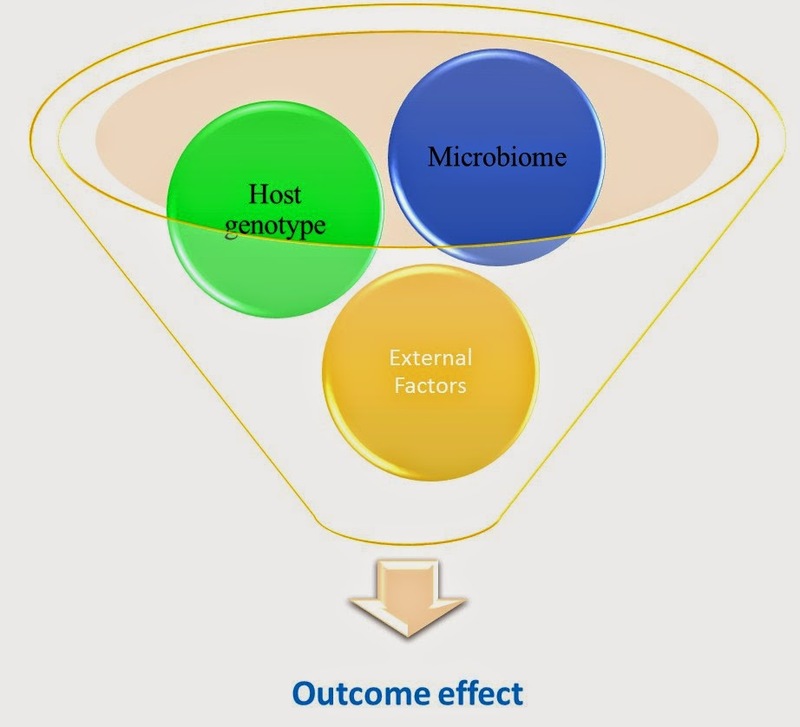 Now put the above story in context with microbiome, and the picture becomes a little clear. My thinking has been influenced by a post in small things considered (Link), as I have quoted in my previous post. There is no good or bad microbiome. In Eric's talk, he posed the difficulty of understanding the microbiome. Does the microbiome influence the condition or is it the other way around. In other words what is the direction of effect. This requires a lot of complicated experiments to understand, however there are some interesting findings. For example, obesity can be transferred in mouse models (Link). A more recent story of a woman gaining weight after FTM procedure has opened a panel of discussion. Evidence is emerging as to association with other factors such as wound healing. The studies hint that microbiome can have a serious effect. But to extrapolate this finding to every condition is exploitation of the concept. In the course of thinking it occurred to me that diversity in microbiome may explain some findings. I'm not sure if I conveyed the idea right during discussion. So let me elaborate my thinking, though I must warn that these are purely my thoughts of projection. As an example, I recently blogged about C scindens and its effect on C difficile (Link). There are a lot more examples of one organism countering the strength of other which is an important part of residential flora- competence. So it is very attractive to speculate having a more diverse population control each other. On the other hand, in some conditions the diversity is suppressed allowing some strains to predominate which may in-turn influence the normal process to a higher degree tipping of the balance. Thinking along these lines seems to explain at least some of the concepts. This also allows variability of the microbiome to be accounted for that is normally seen. Would like to know what thoughts of the readers are.